Good web design starts with well-organized, concise content. I specialize in working with you and your company to understand business objectives and deliver a site that helps you achieve success. My process doesn't start with graphics; it begins with a vision of your aspirations, then develops a framework to fulfill and surpass your goals. Simple, clean designs with bold headlines and easy-to-read copy will set your brand apart from the crowd. Each site I make follows standards-based HTML5 and CSS, optimized for low-cost maintainability, rapid change and high reliability in an evolving digital landscape. What message should your audience take away? I'll help get to the core of your content and organize it in a way where every visitor can quickly find what they are looking for. I want to provide industry-leading service and be the best at what I do. This motivates me never to settle for mediocrity, bringing a high level of perfectionism to each new endevor. I want to make a difference in everything I do - whether it's coding a website or volunteering for the community. I love what I do and believe it will show in the final results of your project. The core of who I am is reflected in the way I run my business. Through straighforward billing and a transparent workflow, you'll never need to second guess our partnership. 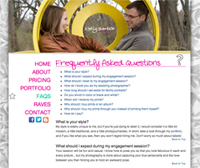 Kelly Benton is wedding photographer in Fort Wayne. Yes, she is also my wife. The fact that she was not a paying client gave me some freedom to experiment.